An explosive new stage adaptation of the legendary double album is touring Britain during 2009. It's an exhilarating roller coaster of a production appealing to rebels and adolescents of all ages! Set in London & Brighton at the height of the 1960s Mod scene, QUADROPHENIA is told through the eyes of Jimmy, a hedonistic style conscious teenager who hates his job, is misunderstood by his parents and lives for his music and to be with his scooter riding Mod clique. MUSIC legend Pete Townshend launched the UK tour of his rock opera Quadrophenia in the Westcountry – helped by a fleet of 40 scooter riders. The Who star was in Plymouth for the official launch of his musical masterpiece and was joined by Vespas ridden by members of local clubs, who rode down the city's Royal Parade just before last night's show. Around 45 riders of all ages brought their prized possessions to the city centre ahead of the opening night of rock opera Quadrophenia: The Musical at the Theatre Royal. Long time scooter fan Euan Barker travelled more than 80 miles from Devon on his iconic Lambretta to lead a procession through Bath. The 42-year-old has followed his passion for scooters for 30 years and said the album Quadrophenia and the subsequent film created a culture of fans united by a love for the fashion and music that went hand in hand with the movement. The father-of-four said: "It means a lot to people. Quadrophenia is a story about growing up and people in their teenage years. Its not just about scooters, and everybody can relate to growing up. Some people in Bath have some really nice original 1960s scooters in fantastic condition and they look brilliant." Father-of-three Stewart Sheppard was in the procession and brought his Lambretta SX 200 CC which he bought secondhand for £144 in a shop in Bath in 1973. The 53-year-old consigned his bike to the depths of his garage in 1979 but dug it out in 2000 after his children left home and spent around £2,500 restoring it to its former glory. Mr Sheppard said: "In the early 1970s, teenage boys were not really interested in cars and we only wanted motorbikes and scooters. That was what the girls wanted. If you had a scooter or motorbike they were willing to ride with you." A GROUP of Tameside scooter enthusiasts took a starring role to welcome an iconic show into town. Members of The Tamesiders took part in a Mod 'ride out' through Manchester to celebrate the opening night of Quadrophenia, the hit '60s film which has been made into a musical. 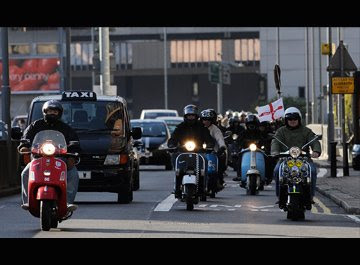 Hundreds of Mods, Modettes and Scooter boys rode their prized Vespas and Lambrettas through the centre of Manchester on Tuesday to finish up at the Opera House, where the Pete Townshend show is being staged all this week. More than 70 scooters from nine regional clubs, including Tameside, were involved in the rally. Among those taking part were some of Manchester's original Mods, who also attended Tuesday's premiere. FORTY scooter enthusiasts marked the opening date of the stage show version of rock opera Quadrophenia last night by riding out from Portobello Beach in Edinburgh. The ride-out across the Scottish capital paid homage to the scooter-riding Mods of the 1960s and their lifestyle as it was depicted in the 1979 film and subsequent stage show. MORE than 70 mods rode on scooters through Cambridge to mark the opening night of rock opera Quadrophenia. The writer of the show and Who guitarist Pete Townshend disappointed fans when he had to cancel his appearance at Cambridge Arts Theatre last night. The disappointment did not quell the high-octane enthusiasm of mods young and old who gathered outside the theatre to meet the stars of the show, Ryan O'Donnell and Sydney Rae White. Sydney said: "It's a fantastic turnout - a lot more than we expected. It's close to the number we had in Bath. Roger Gascoigne, 61, was a mod in the 60s in Cambridge. He said: "Those were great days. Around the theatre here was where we hung out. But there was no trouble here with rockers or anything like that - we were all mates."